This large window is located above the entrance to Central Avenue Christian Reformed Church. Based upon the book, "The Pilgrim's Progress" by John Bunyan (1628-1688), it depicts the pilgrim, Christian, as he journeys "from this world to that which is to come," in Bunyan's own words. The pilgrim is shown traveling through the valley of worldly troubles and despair upward toward the Celestial City of everlasting life and glory (Heaven). In the lower left corner of the window is the figure of Moses, holding the tablets containing the Ten Commandments and a pole with the brazen serpent, as described in the Books of Exodus (31:18) and Numbers (21:8). In the opposite corner is the apostle Paul, who has stepped from a boat to plant a banner with the Christian cross on the new continent. Between these representatives of the Old and New Testaments are two hemispheres representing the world. Inscribed on the window are words from the Book of Hebrews (13:14): "For we have not here an abiding city, but seek after the city which is to come." Designed by Daverman Architects of Grand Rapids, Central Avenue Christian Reformed Church was constructed in 1953. Its twelve stained glass windows were created by John VanderBurgh, who was associated during the 1950s with the Grand Rapids Art Glass Company, which operated from 1912 to 1994. Born in the Netherlands in 1916, VanderBurgh came to the United States with his family in 1951 and settled in Zeeland. In 1960 he opened his own VanderBurgh Art Studio in Zeeland, where he continued to create windows for churches and other buildings in Michigan. To see a photograph of the artist and another example of his work, visit the Window of the Month for May 2000. 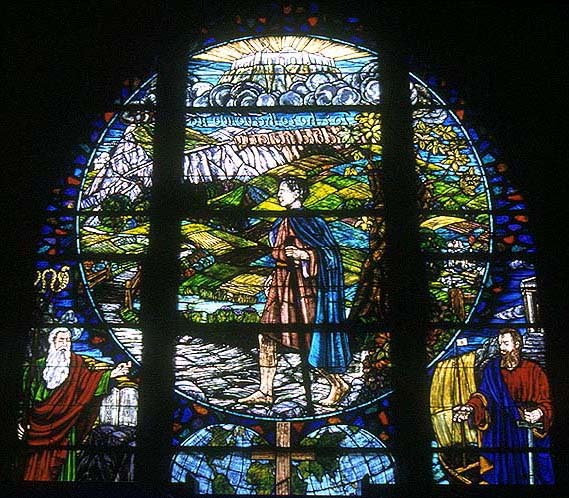 The "Pilgrim's Progress Window" is shown in memory of John VanderBurgh, who died on March 31, 2004. Central Avenue Christian Reformed Church was registered in the Michigan Stained Glass Census by Ray Naber, with photography by Stuart Westing, both of Holland. Text by Betty MacDowell, Michigan Stained Glass Census, April , 2004.